durians are a major thing in Singapore and in my family. 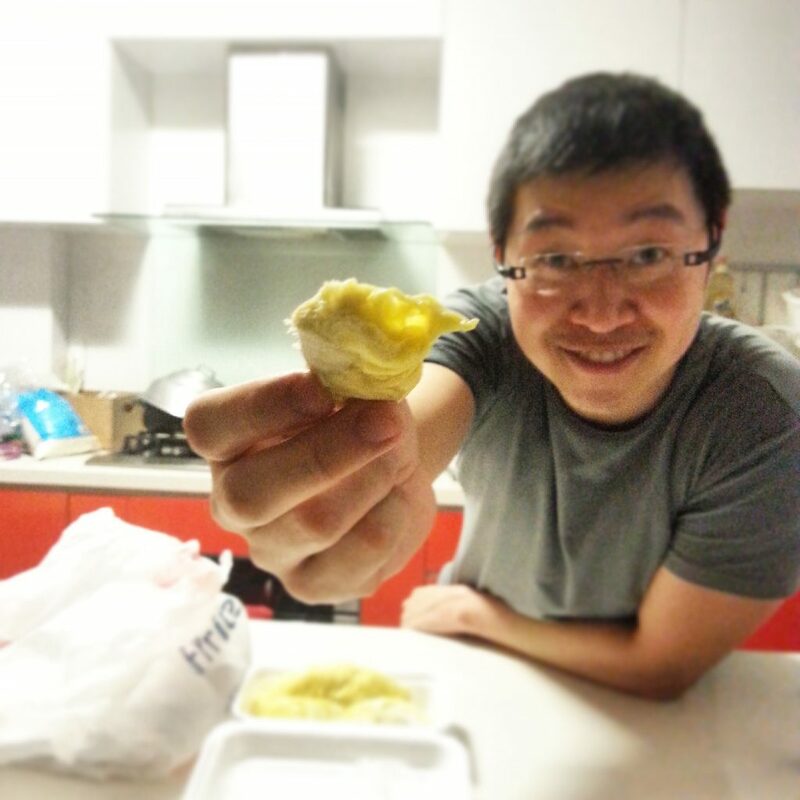 On my side of the family (including extended family), there are only three of us who don’t eat durian, me included. My childhood memories of the family eating durian involves my paternal grandpa going to the neighbourhood fruit stall to get two bags of durians, usually about 6-8 durians, depending on the size of the fruit. 3 for $10 got you fairly decent durians then. Grandpa would come back home with scratches on his calves as a result of lugging the thorny fruit home. Other family members would then spread the newspaper on the kitchen floor so that we could place the durian on the floor. These durians would have been already slightly pre-opened during the selection process. Grandpa would take out the small cleaver and hack away the husk, and everyone would dig in, even myself then. If the kids were eating, we were taking the fruit out of the bags, holding it by the stem gingerly, and putting it on the floor so that the empty husks could be thrown in. There would be some initial silence as everyone eats the fruit, before comments were made about which of the fruit was better than the other. My uncles would also chip in in opening the fruit, tearing open more of the husk to reveal more hidden fruit. Some of the husks were retained as some of us would fill the cavity in the husk with salt water and gargle our mouths with the water to remove the lingering taste of the durian. Durian morning breath is just bad….very bad. There were 10 of us living in that 4-rm HDB flat then, back in the 80s. It was crowded, it was a little chaotic but it was fun. By the time I got to primary school, most of my relatives have moved to a new place, and my family continued staying in the flat. Durian sessions like this progressed on to my uncle’s place, before gradually dying down after my grandfather passed away. As time got by, people became more aware of the different varieties of durians. D24 was no longer the creme de la creme. In came the 猫山王, then the 红虾，葫芦..etc. What was sold as 3-for-$10 durians could be bought at $1 a durian. To save consumers the trouble of having to hack the durian when they got home, the fruit was extracted out of the durian and sold in styrofoam packets. And I stopped eating durians cos I just didn’t fancy it. But it was only the past couple of months that I started thinking about durians. I haven’t tasted fresh durians in many years, eating only the Puteri Mas cold durian puffs. mmM. And I know that Donald loves durians. 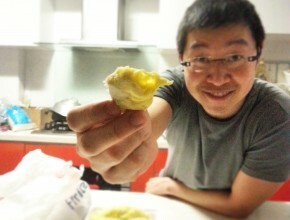 He would eat durians only if he had company to eat it. It doesn’t help that Ollie doesn’t like durians either.